It is in men like David Duke that we see that the world is not yet free of racial profiling and stigmatization as some may have you believe. Here is an American white supremacist, nationalist and separatist, anti-Semitic conspiracy theorist, Holocaust denier and somehow a former representative of the Louisiana House of Representatives. 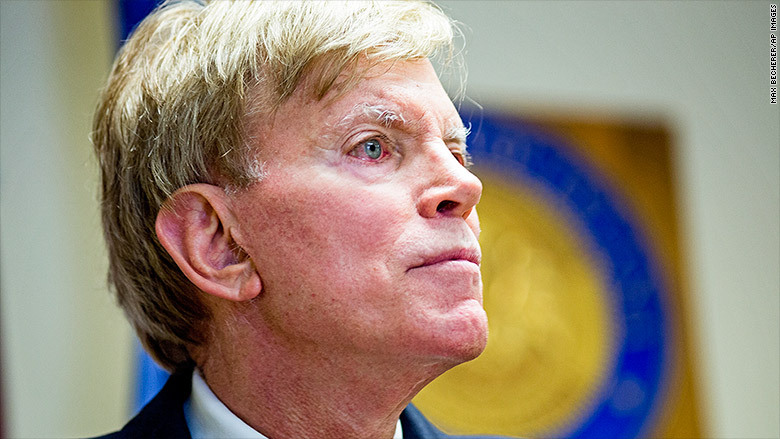 David Duke also has firmly attached to his portfolio the title of being the former Grand Wizard of the Ku Klux Klan and lest we forget, he is also a convicted felon. We look at his biography, what he has done, his relationship with US president Donald Trump and other issues. David Duke was born David Ernest Duke on the 1st of July, 1950 in Tulsa, Oklahoma. He was born to his parents, Alice Maxine Crick and David Hedger Duke. His father was an engineer with the Shell Oil Company and the position solicited for a lot of travel and so he moved around with his family, spending a little while in the Netherlands before putting down roots in Louisiana. What Duke would turn out to be in future was somewhat carved out after he met the leader of the white nationalist, neo-Nazi, Holocaust denial and antisemitic National Alliance, William Luther in the late 1960s. Duke then joined the Ku Klux Klan (KKK) in 1967. He trudged off to college in 1968, enrolling at the Louisiana State University (LSU) in Baton Rouge. It is fair to say his time in college was eventful as he honed his ideological leanings and formed alliances that will come in handy in the future. He was able to form the White Youth Alliance, a white student group. Duke also protested the appearance of lawyer William Kunstler at Tulane University in New Orleans while wearing a Nazi uniform. He also became somewhat notorious on the LSU campus for holding parties on the anniversary of Hitler’s birth and wearing a Nazi uniform. In 1972, Duke was arrested for inciting a riot in New Orleans with several spats of racial confrontations springing up within that time frame. David Duke would graduate from LSU in 1974 and then shortly after graduation, he went on to found the Knights of the Ku Klux Klan (KKKK). Aside from being a racist and champion for white supremacy, Duke also found time to run for elective office, with some lofty targets set and equally earth crushing descents as well. His first ran for the Senate of the state of Louisiana in 1975 as a Democrat. He got 11,079 votes, which was one-third of the votes. In a three-candidate race for the 10th District Senate seat, Duke finished second with 26% of votes as a Democrat in October 1979. In 1979, after a first failure to win the presidential seat as a Democrat, Duke left the Klan after a series of violent incidents to create the National Association for the Advancement of White People (NAAWP). After he had failed to build any momentum as a Democrat, he gained the Presidential nomination of the Populist Party after a failed bid with the Democratic party. He received 0.04% of the national popular vote. A year after his failed presidential bid in 1988, Duke joined the Republican Party and in a special election held to fill the vacant District 81 congressional seat vacated by Charles Cusimano of Metairie, Duke defeated his closest rival, John Spier Treen with 50.7% to 49.3% of the vote in a runoff election. Duke’s tenure in the House lasted from 1989 to 1992. It was short and uninspiring, with little to nothing with regards to lawmaking. In 1990, he ran for the US Senate but lost to incumbent J. Bennett Johnston. He ran other failed campaigns including a 1991 campaign for Governor of Louisiana, a 1992 Republican Party presidential candidate bid, a 1996 campaign for the US Senate and a 1999 campaign for the US House. Aside from his limp political tenures and forays, Duke has written some books and published them. He has a net worth of an estimated $1 million. What is His Relationship With Donald Trump? In the build-up to the 2016 Presidential election, Donald Trump, the Republican candidate found himself being endorsed by David Duke, even though Duke claims he was only endorsing the policies of Trump and not necessarily the candidate himself. Trump came under intense media pressure to denounce David Duke and he finally did in early 2016. Since then, Trump has been criticized and praised by Duke, when the president’s actions strike his gong at certain issues. Duke met Chloe Eleanor Hardin while in the White Youth Alliance. They stayed together through college and were married after in 1974. The Dukes split after ten years in 1984 but in that time, Hardin gave birth to Duke’s two daughters, Erika and Kristin.